Finally the long wait is over! For all of you who were waiting for this post, (*ahem*... 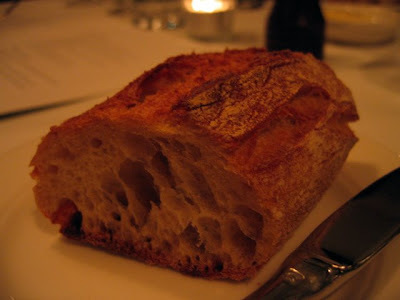 I should say both of you), I am now writing about our dinner at Bistro Guillaume. The space (formerly Prada) is beautiful. Marble benches, candles, French bistro chairs, dramatic petticoat-shaped lamps in the front section, (no, that's not the technical term, but that's what I thought when I saw them), patterned lamps in the back section. We were in a group of 5 for a special occasion, and got a table at the back, which happened to be quite private, and had banquette seating along one side of the table. (Wahoo, I love couches). The grey leather banquette was very comfortable and had mirrors above it. So, I sat in comfort all night; my brother sat on the opposite side and could admire his reflection in between courses. It was win-win! The only complaint about the atmosphere was that it was really cold all night! The air-conditioning must have been on high, and there was a vent right above us. Brr! We did mention this to a waiter, but it remained cold all night. No matter; I don't think the temperature is controlled by the staff anyway. We don't tend to drink wine when we go out; we're not big drinkers, and wine at restaurants can make the bill soar uncontrollably. (Being concerned with money isn't glamorous I know, but I may as well be honest). However, my family does love a good aperitif! 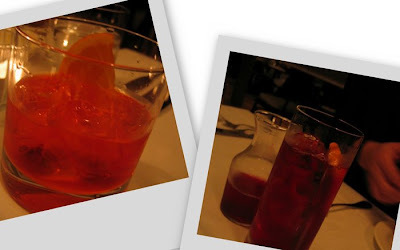 Aperol on the left, Pimms and cranberry on the right. Aperol is the French equivalent of my beloved Campari - it has a bitter anise flavour. Love it. You receive quality, intensely chewy pieces of baguette, and butter with fleur de sel. 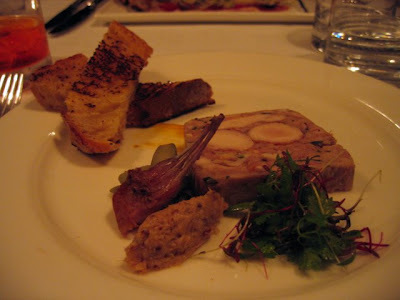 Mine: Rabbit Terrine, including cornichons, dijon mustard, toasted sourdough bread, and a cute little rack of rabbit. We were so incredibly impressed by the entrées! 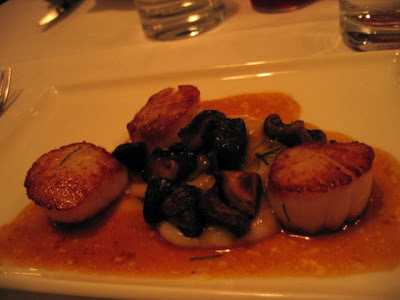 Especially the scallops that my father and brother's girlfriend both ordered. They were perfectly cooked, and the jus was intensely flavoured - a great combination. I loved my terrine, not just for its flavour, but also its texture. Within the slice itself were whole pieces of tender rabbit meat, as you can see in the photo above. I believe that these pieces of meat would be the bunny-equivalent of backstrap or fillet, but I can't be sure. Before I get on to our main courses, I should just admit to an embarrassing obsession with restaurant crockery and cutlery. The crockery at Bistro Guillaume was all Villeroy and Boch. 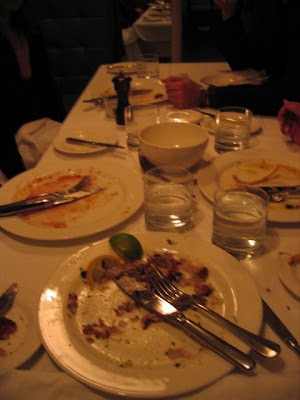 (Yes, I turned the empty plates over to check). Their steak knives are very fancy Laguiole. 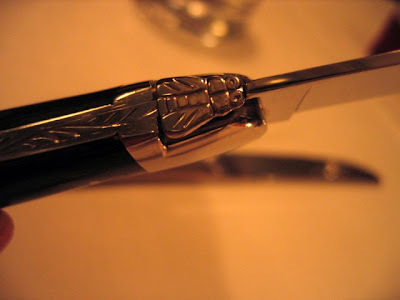 Look at the bumblebee detail on the steak knife! Oooh! Aaah! Mine: Steak Frites, sauce béarnaise. "Hey, these are like Maccas chips but sooo much better!" I had been craving a good steak frites for weeks, and I'm glad to say that this one lived up to my expectations, if not exceeding them. Bistro Guillaume fish and chips - whole whiting with pommes Pont-Neuf and buerre maitre d'hotel. Skilfully boned, delicately fried, very impressive. Mixed leaf salad with shallot vinaigrette. Not just a lazily-thrown together side salad, but a deliciously refreshing selection of leaves, including tender red and white witlof, and a tasty dressing. Eaten, but not photographed: a risotto with field mushrooms and Reggiano parmesan. When I first saw this on the menu, my first reaction was that it must be the vegetarian's punishment. However, having stolen a spoonful or two from my brother's plate, I found that it was, in fact, a delight for vegetarians and omnivores alike. Comparison of the 2 steaks - notice that mine was rare, whilst the other was "medium-to-well-done". Both were cooked exactly the way we wanted them! I am quite amazed that we managed to demolish such a large amount of food. Having all thoroughly enjoyed our meals, we were greatly looking forward to dessert. I am sorry to say that 4 out of 5 of us were disappointed in this department. First up, a nice coffee. Cafe Latte - ooh, La Perruche sugar! ... but were, unfortunately, way too sweet. With the first bite of my soufflé, I could already tell it was too sweet for my taste. I persevered though, and made it about halfway through before I admitted defeat. I'm not sure what you're supposed to do in this instance - the dessert wasn't poorly made, or faulty, just too sweet for my taste. Do you just send it back? Ideas anyone? My father ordered the same thing, and also found it too sugary. Oh well. The brûlées, whilst not quite as sickly sweet as the soufflés, were still quite underwhelming. According to my mum and my bro's girlfriend were that it was (again) too sweet, too rich, just average. 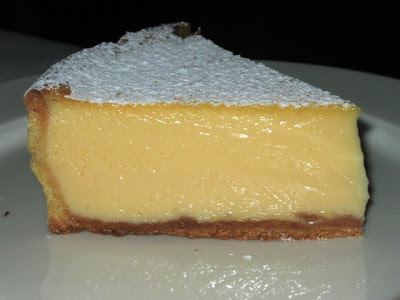 My brother, however, ordered the lemon tart, which was divine. Crunchy base, soft, soft lemon interior. Why didn't I order that? Despite the desserts, we all really enjoyed dinner here, and would definitely come back again. The atmosphere was lovely, the service was professional and prompt, although personally, I would preferred it if the hosts and waiters in general were a bit warmer. (Apart from the waiter who served our table, took our orders and explained the menus. He was very cool). We loved our entrées and mains, and even though they were pricey, we felt they were worth it. I assume I'm one of two who was waiting for this post :-). I agree with you Sarah that wine can really hike up the price of a meal. In fact, wine might even cost more than the meal, but I think good food deserves good wine and usually I will get wine. I like the photos of the interior. I haven't seen any photos of the interior yet. It does look very stylish. 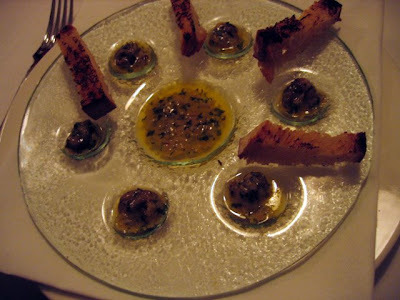 The food all looks and sounds very good, especially the rabbit terrine and the famous Bistro Guillaume fried fish. We had a few similar things happen this week. I too dined at a French bistro for an ultra late birthday dinner. Was your dinner for your birthday too? At Frenchy's Bistro in Glen Waverley, it was really cold too. We purposefully made shivering actions when the waiter was around and he turned on the heat for like a minute before another waiter switched it back off. Strange. We were left sitting in the cold all night. Also, at Frenchy's, I found my chocolate souffle ultra sweet too. In fact, all my friends desserts were ultra sweet as well and was quite hard to eat it all. I don't really think you can send that back as it's not made incorrectly, just not to your liking. Lastly, I turned the plates over at Frenchy's too to see what they were. They were Maxwell and Williams plates and the cutlery was really nice too, but I forgot to look at the brand. But that's where the similarities end. My meal at Frenchy's wasn't that good, whereas your food sounds much better. I think you're right about the wine - in my case, I enjoy wine with food, but I feel like I don't know enough about wine to choose the right one at a restaurant, and then fork out money for it. Too much pressure, haha. I remember once being taken to a really good restaurant in Melbourne, where the sommelier chose a different glass of wine with each course. That was awesome! Although I was getting kinda tipsy by the end of the meal. We do have our favourite wines at home, which we have with meals. My dad is really into wine, so I'm lucky that I can drink from his collection! Actually this dinner was for my Dad's birthday! His is just a couple of weeks after mine. And my brother's is a couple of weeks before mine. So lots of expensive dinners are concentrated in April/May! I regretted not making a birthday cake for Dad. Normally I would, but my hand was already hurting then. 5 desserts were almost $100, and weren't that nice. If I'd made a cake, it wouldn't have been as fancy, but I'd have been able to make it to suit our tastes, you know? After the meal, when we mentioned to our waiter that the souffles were too sweet, he actually told us that many other patrons had complained about it too. Odd, for a restaurant where everything else was so good! Oh, and something else dorky. 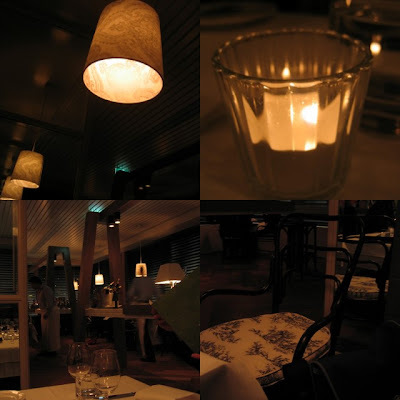 Longrain and Rockpool use Pillivuyt crockery, and Rockpool uses Le Thiers steak knives. Although I guess you don't need a knife if you're having the $110 Wagyu. Hehehe. I hope you get a chance to make it to Bistro Guillaume soon. I think you'll really enjoy it! I don't know much about wine too, just what I like and what I don't so it's a bit hit and miss as well. All my good friends and I's birthday are in this April/May/June period too, so we're spending heaps celebrating during this time as well. I totally agree with you regarding desserts. It's the one thing that I can make and it feels such a waste sometimes to have one tiny slice of bad cake that costs $15 when I know I can do a much better cake. That's where restaurants can really make money off you. Hence I judge a restaurant very harshly in terms of desserts. Easy things like ice cream that costs $15 I will never order. You really do pay close attention to the cutlery and crockery. With the Rockpool wagyu, it's so tender you can just break it with your fork. Mmmmmmmm. Bistro Guillaume sounds very good, I'm going to try to go soon. Thanks for the very good write up. I should probably do a wine course or something. I'd love to have a bit more knowledge, and become an afficionado instead of an enthuiast. I think in Bistro Guillaume's case, all their desserts are made in-house. I actually found myself wishing I'd ordered the ice-cream! The scoop of vanilla (mmm... real vanilla beans) I had with my souffle tasted great! So in that case, with the ice-cream made in-house, with good quality ingredients and interesting flavours, I wouldn't mind paying for it. Of course, at most middle-of-the-road restaurants they buy the ice-cream in, which is totally not worth it! My parents taught me never to order $5 "lychees and ice-cream" at Chinese restaurants, haha. "You know ah, Sarah, you can buy 5 tins of lychees and a tub of ice-cream with $5!!" I thought I'd chosen well with the souffle (I love chestnuts, they happen to be expensive and souffles are hard to make at home), but I lucked out. My bro's lemon tart was the best out of what we ordered. Lol, I worked for a year in a cookware store, so I got obsessed with cutlery/crockery from there. It doesn't influence my judgement of a restaurant; I'm just curious to see what different restaurants choose. At home I've got a mixture of cheap things and a few expensive splurge items (mixer, serving platters, coffee machine etc). As well as random things I pick up on my travels! I wanted to go to Bistro Guillaume for a work dinner recently but the boss was a bit hesitant of the cost. So we chose the Brasserie instead. Much difference! Pah! BUT the food was sensational. I had chicken liver and foie gras terrine with onion jam. The jam set off the richness of the terrine very well and it was quite a large serving for such a strong flavour. Probably not recommended for anyone who doesn't like lots of intense flavours all at once. Next I had tenderloin and ox cheek with kipfler potatoes. Another large serving - a whole fillet of tenderloin plus a chunk of soft, falling apart and rich cheek. The jus to go with it was awesome too. Have you been to the Brasserie? I actually LOVE The Brasserie! That's a tie for my favourite restaurant, with Tutto Bene. I've been there a few times, because their food is excellent and they're very well priced! (The lunch deal is fantastic.) I actually recommended for my French class to go there last year for their end of year celebration - it was the cheapest French lunch option we could find. 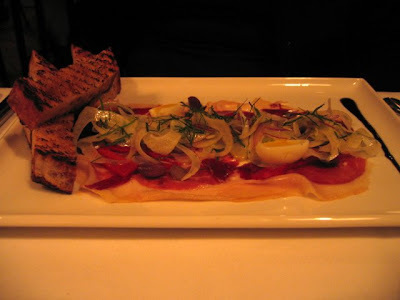 I really liked Bistro Guillaume too, but I don't know how often I'd go there - it's quite posh and expensive. Just for special occasions. If you search "brasserie" in the search box at the top left hand side of the blog, the posts should come up. They're from a while back, I think, so the menu will probably have changed by now. That terrine you had sounds delicious. I had a mixed duck chacuterie the last time I went, which I loved. Any restaurant thats in the Good Food Guide would be able to match/recommend a glass of wine to your dish. Just ask the waiter and perhaps just joke, 'not to crazy expensive'. Make it part of your food reviewer test and see what you get and then go home and look up the wine style. You'll be amazed at how much you can learn. Thanks Jack, that's a great idea! I'll definitely try that next time. 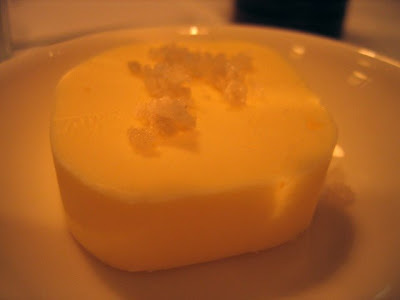 -The bread looks delicious, and I love how they sprinkled sea salt on the butter. 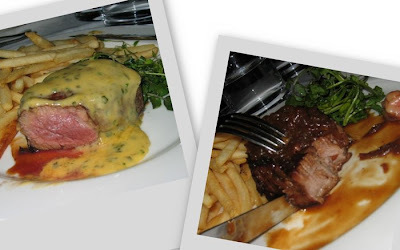 -Your steak Bernaise & frites is an Ultimate Meal and looks perfect. 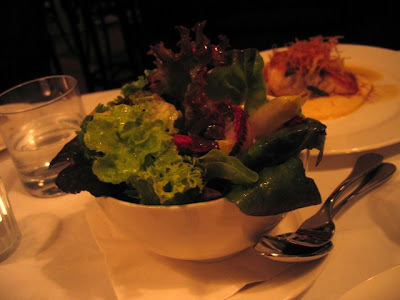 -The salad looks perfect, too! -I'm beginning to wonder if maybe "most" people have a real sweet tooth? A lot of the time, I find desserts too sugary or over-the-top. -Learning about wine & food pairings is something I think you would pick up on very quickly. Meanwhile, at a good restaurant, with a smart waitperson, you should be able to ask for a good recommendation (by the glass) with price being part of the decision, and not be made to feel self-conscious. It's all knowledge that comes with experience and that should be fun & interesting, and the smartest people will be helpful to you. -I've never thought about spending money on Langioles, and yet...that was before I knew about the bumblebee. I had no idea. Last but not least: Happy Birthday to your dad! !